16 members of Cornwall Council’s Strategic Planning Committee (with one abstention and no-one against) resolved to approve a major mixed use urban extension to Redruth, following many months of intense work by Tetlow King Planning (TKP). The ‘hybrid’ application comprised detailed permission to transform the A3047 dual carriageway into an attractive urban street and new gateway to Redruth; and outline permission for redevelopment of former mining and agricultural land west of the town to provide up to 370 dwellings, employment space, community facilities and green infrastructure. 20% of the dwellings will comprise affordable housing. 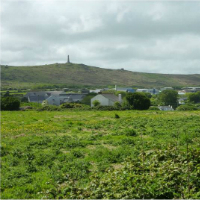 TKP was instructed to co-ordinate, prepare and manage the planning application and the associated Environmental Impact Assessment; on behalf of Percy Williams & Sons Ltd., a long established, family-run building company based in Redruth. Elizabeth Boyd, Associate Director at TKP, who co-ordinated the proposal said that members were particularly complimentary about the way in which the applicant and his professional team had gone out of their way to engage with Councillors, the Town Council, key stakeholders and members of community from the outset. This effort ultimately proved decisive, with only three objections being made to the application by members of the public, an extraordinarily small number for a scheme of such magnitude and complexity. A landscape-led approach was taken to ensure the best possible development for the site and was subject to a very detailed and robust Environmental Impact Assessment; all of which was co-ordinated by TKP. Issues included traffic, noise, air quality, archaeology, drainage, land contamination and ecology. The design team engaged extensively with officers, statutory bodies and members of the public throughout the process. Exeter-based LHC were the architects and urban designers. The site was earmarked as a strategic development site in the Council’s emerging Local Plan. The application was accompanied by a comprehensive masterplan guiding development to the north which has potential to provide a further 280 dwellings and employment space in future phases. The entire development offered numerous regeneration benefits to Redruth and its surrounding towns of Camborne and Pool. Committee members welcomed the opportunity to achieve such a comprehensive and well-thought out development in such adverse economic conditions.